Happy Happy Saturday!!! I don't know about you, but I am seriously freakin' excited that it's a long weekend!! 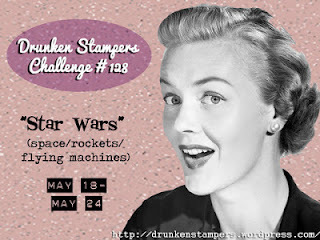 This week's Drunken Stampers challenge is inspired by one of my all time favourite movies, Star Wars...yep I am nerdy, I even keep a Star Wars themed day planner in the craft room, it says "Do. Or do not. There is no try." on the front of it. I love the Star Wars movies because I can remember my parents taking us to see them in the theatre as kids (ya...I am THAT old). So for this week's challenge you can use Star Wars as your inspiration, or space / rockets / flying machines. If you are a particularly brave soul you might try to use ALL three! Visit the DRUNKEN STAMPERS BLOG for all the details on this challenge and to show Team Bahama some love! A few weeks ago I came across these super fantastic little Galaxy Paper Tots by kiki and company You totally need to check these out! The set comes with 10 different figures AND two sizes of the Millennium Falcon!! I might have mentioned that my cousin Alley is expecting, Baby Bean will arrive later this year in October...and Baby Bean's Daddy is a big Star Wars fan...so I am going to make a series of Star Wars themed baby cards, this one is the first one, we found out TODAY Baby Bean's gender!!! GO TEAM PINK!!! 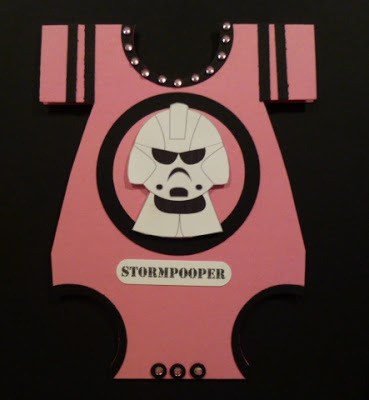 I started with a onesie in Pixe Pink (SU) and used Basic Black (SU) for the accents.The stormpooper and sentiment were printed on Whisper White (SU). The bling on the buttons on the bottom and the neckline were a gift from fellow Drunken Stamper Barb G - thanks Barb!! Come play along with the Drunken Stampers, you have until 11:59 PST on Friday May 24th to link your card to the Drunken Stampers blog, who knows, maybe YOU could be our next Life of the Party!! Love it, so very cute. 'Aren't you a little short to be a Stormtrooper?' LOL! Yep, I'm a Star Wars nerd too! Donna I love this Stormtrooper onsie! Totally brilliant! This is SO awesome. This is one that will get scrapped into a baby book or kept with the baby stuff for sure!!! Thsi is so funny! Great idea - you have some really great creations!